Caldo verde, or “green soup,” is traditionally made with sausage and loads of potatoes. 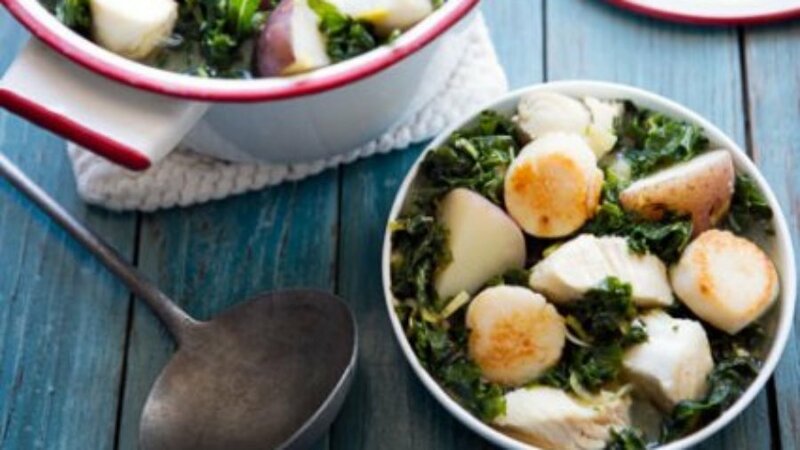 The lighter seafood version is nourishing and satisfying with protein-rich scallops and calcium-packed kale. Heat 1 tablespoon of the oil in a medium pot over medium-low heat. Add bacon (if using) and leek and cook, stirring occasionally, until softened but not browned, about 8 minutes. Add stock, potatoes and kale and gently simmer for 10 minutes. Add fish and simmer until potatoes are tender, 10 to 12 minutes. Remove and discard bacon. Season scallops on both sides with salt and pepper. Heat remaining 1 tablespoon oil in a large skillet over medium heat. Add scallops and cook, turning once, until lightly golden, about 2 minutes per side. Ladle soup into bowls, top with scallops and serve.